Nothing beats spending time with our kids, but taking and making the time to talk, laugh and share the ‘pain’ with other grown-ups is totally key to staying sane as a parent. Losing touch with our friends, and struggling to make new ones, is such a regular occurrence for many mums especially, which is why we’ve always loved the idea of MUSH – the app for helping mums meet more mates nearby. And we’re not alone – hundreds of thousands of mums now use Mush across the UK and beyond. With it being Stress Awareness Month, we’re focusing on how parents can relax and de-stress amidst the whirlwind of modern day parenthood. So we caught up with one of Mush’s Founders, Katie, to ask her some questions on the story behind the app as well as to get some advice on how she juggles it all. Luckily, Mush are our neighbours in the office so we didn’t have to go far! 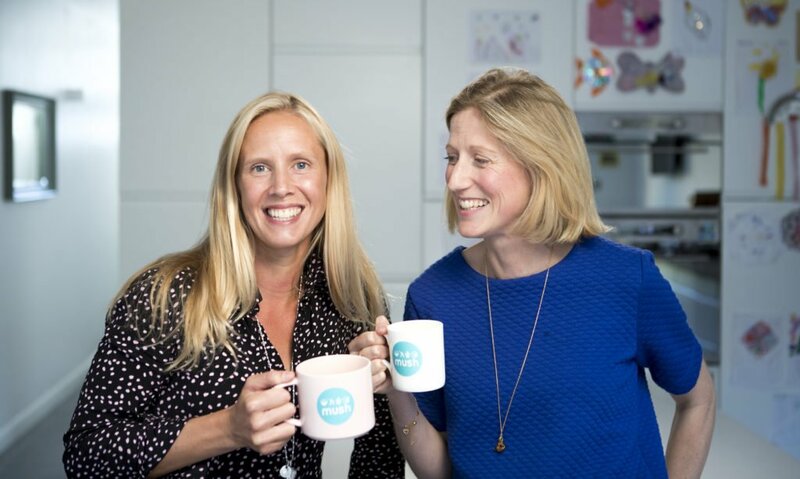 I am Katie, one of the two founders of Mush (the app to make mum friends). I used to be a broker in the City, before I had a family and realised there was stuff I was better at than quoting numbers down a phone line. I have a husband who works in rugby and two little girls, Tilly, 5 and Lyla, 3. Mush is a free app that takes your profile (your area, kids’ ages and interests) and finds you friends nearby. It takes a matter of minutes to sign up and then you can message other local mums, arrange meet ups, ask advice and find out local information. It’s every mum’s companion to the first years of being a mum. How is the app helping Mums de-stress and stay sane? We know it’s awesome being a mum on the whole, but those days at home with a small person are long and can be lonely. Added to that is the pressure that you are meant to be having the best time ever (according to social media!) which can feel very far from the truth at times. Mush gives you access to local mums in the same boat going through the very real pressures with you. Even better, it encourages you to get out and meet up rather than discuss things online, because we all know that’s way better for our mental health! I remember days when I was on the verge of pulling my hair out/ bursting into tears. Meeting with a pal had me in (slightly manic if I’m honest) laughter about the very same things I was bothering about an hour before. You started up after experiencing the problem yourself – but has it taken you by surprise just how many other mums felt the same way? Sarah (the other co-founder of Mush) and I met in a playground with 2 under 2 each. We were the ones crazy enough to be in a playground at 8am on a rainy November day, already pretty overwhelmed with the 12 hours alone ahead of us. That was a lifeline of a friendship we struck up that day. After reflecting on that time and how much better things were with a local friend or two to call on, we just knew we had to have a crack at making a platform that brought mums together. The surprise has been how many people have said that they had exactly the same idea! We knew mums were crying out for this and have been delighted that hundreds of thousands of mums across the UK have flocked to Mush. Are Mums still scared to ask for help? Why do you think this is? We are riding a wave of awareness around maternal mental health and thanks to some high profile campaigns, there is far less stigma about admitting you aren’t ok. But there is the rung above this of people who are feeling fine, but embarrassed to admit that they aren’t enjoying every moment. Motherhood is something we often aspire to and are meant to love, but it can feel lonely. There is no harm in admitting that and I think it’s becoming a more acceptable thing to say. Does being a Mum make it harder or easier to start and run a business? What tools and tricks do you use to help you manage it all, stay sane and relax? We are big fans of the to-do list. Mainly on a google doc, though I hear there are some amazing other tools out there! That and exercise whenever we can. In fact I jump up and down in front of free Youtube fitness videos in my tiny sitting room most mornings, whilst the kids ‘help’. When all else fails (and in fact when all else is pretty great), wine is the original mum friend. What are your top tips to other “parent-mum/preneurs” out there thinking of starting up? You can download Mush for free on iOS & Android now.